Substance use is consistently identified as a top health issue in Wisconsin as a whole and Winnebago County specifically. Currently, areas of specific local concern include, but are not limited to, opiate use, the drinking culture, and youth tobacco use. WCHD supports efforts that work on preventing use, reducing harm from use, and increasing access to treatment. re:TH!NK is working to reduce underage drinking, reduce alcohol-related harm caused by excessive drinking,and promote a healthy culture around alcohol consumption in Winnebago County. The re:TH!NK Alcohol Team is currently working with municipalities to decrease binge drinking and to reduce access to alcohol by minors at festivals and events in Winnebago County. CHEERS! is a free workshop facilitated by local police officers for anyone serving alcohol in any capacity to increase the safe sale and service of alcohol. Attendees learn everything from how to spot fake IDs to rights related to serving intoxicated individuals. WCHD helps support and facilitate these trainings. The Winnebago County Drug and Alcohol Coalition, with backbone support from WCHD, has been formed to address substance use and misuse. Currently the action teams are focused on treatment/recovery, prevention/awareness, data collection, and communication. Using this new approach offers the opportunity for more involvement from the community and the ability to continue the vital work the original Task Force set out to accomplish. 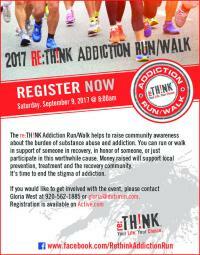 The Prevention Pillar of the Heroin Taskforce (now known as WCDAC) created the Rethink Addiction Run/Walk in order to raise community awareness of the dangers and effects of drug addiction. WCHD is an active member of the planning team. To register, visit dutrirun.com. Winnebago County was one of six counties selected to receiving funding, training, and support to develop a drug overdose fatality review program. The program consists of a county-wide partnership across sectors that leverages inter-agency data sharing and practitioner expertise to review fatal drug overdoses. The program seeks to identify strategies for prevention and intervention that address the problem of drug use and overdose in Winnebago County. Lifepoint is a needle exchange program aimed at reducing the transmission of HIV and Hepatitis C and other potential harms associated with injection drug use. WCHD is a satellite location for ARCW's Lifepoint program. Learn about the initiatives between Outagamie and Winnebago Counties to increase safe sharps disposal. re:TH!NK, the Lakeshore Tobacco Prevention Network, is a 5-county multi-jurisdictional coalition covering Winnebago, Manitowoc, Sheboygan, Kewaunee, and Door counties. Members are working to improve the health of community residents by reducing tobacco use and exposure through prevention strategies and policy creation. WCHD and Northeast Wisconsin AHEC (Manitowoc) each house a coalition co-coordinator to collaborate and coordinate tobacco prevention efforts in their respective counties. The re:TH!NK Youth Coalition is led by 13-18 year olds who work to make Winnebago County a healthier place to live. The coalition is currently focused on tobacco free parks. WCHD staff advise the coalition and support their work. Learn more about WCHD initiatives specific to Mental Health. Back to Mental Health and Substance Use Initiatives.